Every now and then you see a guitar where you think yes I just have to get it. Well this is true for our latest Top Guitar of the Week a unique Fender Stratocaster Vans off the Wall 2008. Sadly I am not sure I can afford the price tag but hey I can dream! Now you can’t go too far wrong with a Fender Stratocaster and especially one that is so eye catching. 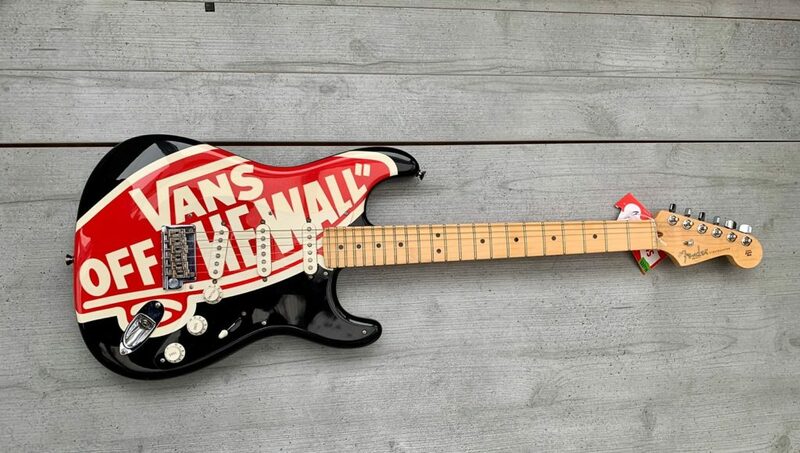 The Fender Stratocaster Vans off the Wall 2008 guitar is a very rare beast. Produced in collaboration with Vans Footwear there were only 25 made. Each guitar was either given to skaters, displayed in Vans stores or given away as competition prizes. It could be argued that the fact that these are limited edition guitars would make these highly collectible instruments. The guitars were made at Fender’s Corona plant and are a standard Fender Stratocaster configuration. Apart that is from the rather eye catching paint work. The particular guitar we have seen was a competition prize for Kerrang! magazine. If you like the look of the guitar, and we can’t see why you wouldn’t, you can find out more details at Reverb.com. It is currently for sale with a price tag of £2500 + shipping.